First post in 2018! Say what! One of my resolutions is to be more active on my blog. So here it goes haha. Last year, I able to grab my chance to shop at Colourpop during their Holiday sale. 20% off storewide, so a real deal. 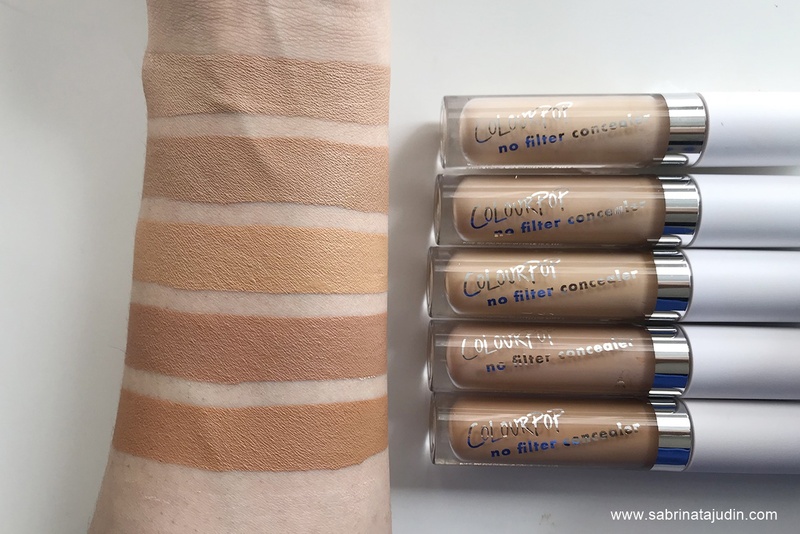 I always wanted to try their No Filter Concealers. So I manage to grab all shades with the 20% off deal + Free Shipping to Malaysia. A real deal. It was 6.00USD and after discount it was 4.80USD. Approx around RM20.00 each. But my package was supposed to around by end of November, there was a bit of a problem and actually, the delivery man kept my parcel without noticing. After I called around the end of December, then they only said that I have to pick it up myself. Gheess. A lot of you asked me if I get any custom tax charges. This is my 4th order from Colourpop. Usually, the package that is valued below RM400-500, will not get customs charges. Usually, my Colourpop orders are around RM200+ (50USD+ order total eligible for Free International Shipping). Also they deliver using USPS. The ones that always caught with Custom Tax are DHL. If you find this a hassle, you can also join pre-order spree from IG sellers. If you are on of them, comment down below! So let's move on to the review. The Colourpop No Filter concealer comes in 15 shades. From the fairest to the darkest. Each concealer comes in a cute pink box and a plastic tube. The applicator reminds me of the Urban Decay Concealer. It has a flexible flat applicator that I actually love because it does not drag my skin when applying it, especially under my eye area. Overall : I love the texture of the concealer. It reminds me much of the Urban Decay Naked Skin Weightless Complete Coverage Concealer that I repurchase over 3 tubes. It covers up beautifully and does not feel cakey at all. 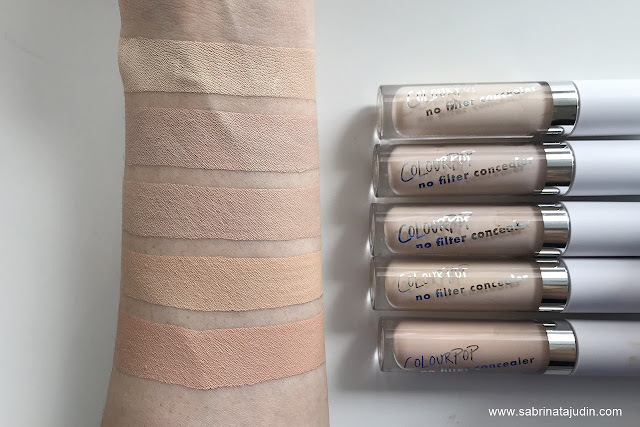 The downside of the concealer is that I could not find a perfect match for my skin tone. As above picture shown the comparison of the Colourpop No Filter Concealer with my other concealer that I usually use. My perfect match is the Tarte Shape Tape in Light Medium & Maybelline Fit Me in Sand. 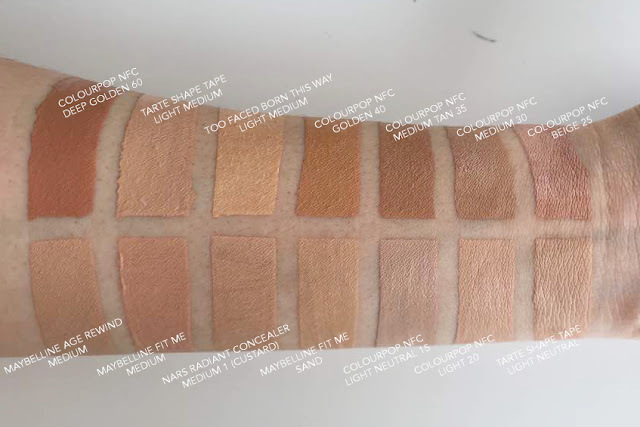 Most of the concealer from Colourpop are peach undertone or looks too neutral. I hope Colourpop will come out with more medium and yellow undertone range in this line. The price point is amazing, but the colour selection is not that variety. My most close shade is Medium 30. 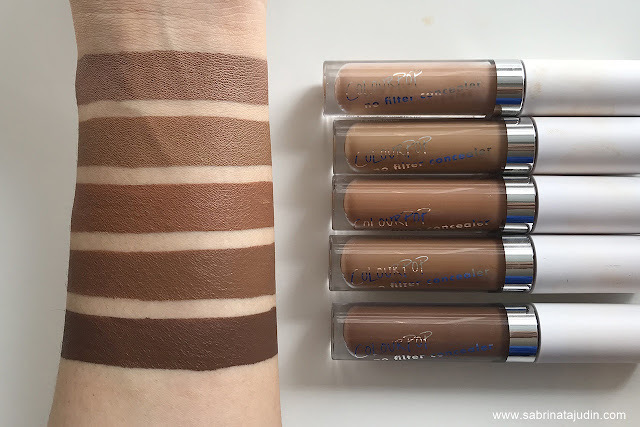 For the other darker shades that I have I use it for contouring & shading.